There’s not a morning that I wake without a thousand questions running through my mind. …And why have eyes that see and arms that reach Unless you’re meant to know there’s something more. If not to hunger for the meaning of it all then tell me what a soul is for. I hadn’t seen this movie for years, but, when we recently watched it, I remembered how much I identified with it when I first saw it. Back in 1983, when Yentl came out, we were going to a charismatic, fundamentalist church. We learned a lot about the Bible there, but I also learned that that sort of church wasn’t for me. Women’s roles were very traditional – and I did not fit that at all. The sort of questioning I do doesn’t fit in churches in general, and it certainly didn’t fit in that one. After awhile, I started wondering if I could even be a Christian at all – I didn’t do things the same way they did. I didn’t have the same view of women and men. I always wanted to push and question things just a little bit further. So Yentl, with the main character who confuses male and female but who does that with a fierce devotion to God, struck a chord with me. Or maybe a symphony – going from the beginning, where she fails at all the housewifely tasks, to the end, where she strikes out on her own. It’s easy to criticize Yentl. The story (screenplay by Barbra Streisand and Jack Rosenthal) doesn’t stick to Isaac Bashevis Singer’s original short story, Yentl, The Yeshiva Boy. The direction and production, also by Barbra Streisand, is totally focused on her character; in fact, there is only one scene in the entire movie that she doesn’t appear in. It’s a brief one near the end, where Avigdor and Hadass are reading Yentl’s letter. But, they don’t get to say anything; instead, you hear Barbra Streisand’s words. Barbra Streisand is far and away the main star, and does all the singing, even though Mandy Patinkin (Avigdor) had already won a Tony for featured actor in a musical (Che in Evita). But I still love it – because of Yentl. Back when the movie came out, I identified with this because I always had a book or magazine in the kitchen. There was all this spare time to fill while cooking. It’s also why I prefer to make casserole-type meals – which generally go for longer and are less likely to burn while I’m reading. I finally gave up reading while cooking one day when my older son was about five. I had made him a grilled cheese sandwich, and his face lit up when I placed it in front of him: “Mommy, it’s not burnt!” I had finished Newsweek, and hadn’t started reading anything else that afternoon. Her relationship with her father is a very loving one, and I identified with this also. Unlike many feminists, I’ve never been bothered by the idea of God as Father. My father was very loving so the idea of God as a loving Father comes naturally to me (except when the idea is messed up by churches). One thing I didn’t understand when the movie came out, because I hadn’t experienced it, was her reaction when her father died. She just sits on a bench in their house while the women of the village bustle around her. I understand that now because when my father passed away, if I hadn’t had small children to take care of, I might very well have just sat in a chair and stared at the wall. It was tempting. Wrapped in the shawl that learning weaves. She walks into the book-filled rooms of the yeshiva – how wonderful! At one point, she asks, in surprise, how Hadass gets all the cookies the same size (Yentl’s cookies also come out burnt). I also, sometimes, end up watching and wondering at other women that can do feminine things properly and who say all the right things. This occasionally interferes with conversation! 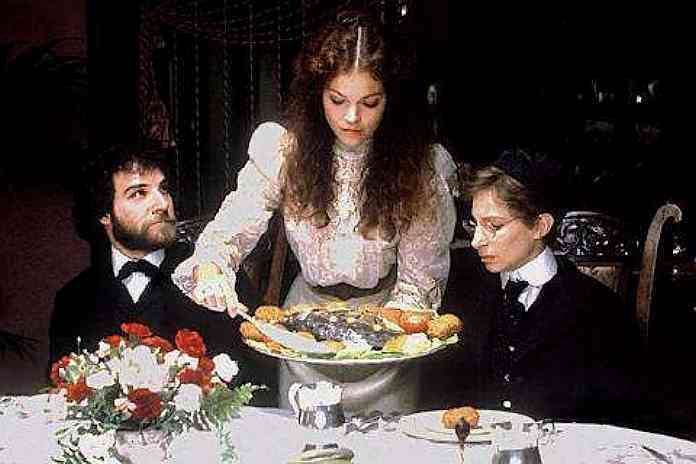 One thing that I missed when I originally saw the movie (five years before my oldest child was born) was Yentl’s nurturing aspect. Even though she’s not planning to marry or have children, she is gentle, loving and caring with her father. And with Avigdor also. She combines the intellectual and the nurturing in a way that is much more familiar to me now that I have children. The movie ends with Yentl striking out on her own for America. Striking out on my own is also tempting, where churches are concerned. If it weren’t for my children’s involvement and if it weren’t for the Eucharist, I’m not sure if I could keep myself going at this point. That from my window I could only see a piece of sky. Just a piece of sky! Hi. Came across your site searching for photos of Amy Irving. Yentl sat like that after burying her father while others bustled around her because she was sitting shiva. "Shiva" is Hebrew, from a root meaning seven, the same root that gives us "Shabbat." In Judaism, after the burial, mourners sit for seven days in the home on low stools or the floor in order to mourn and don't attend to other business, and others take care of the mourners. So, Yentl was doing this because this is what is done. I do like your observation. I haven't seen the movie in decades and do not recall that scene in detail nor what I observed about it. If Yentl was sitting quietly, I don't know whether I would have interpreted her as sitting in devastation with no energy to do anything, or whether I would have just thought it to be the normal way to act in such a situation. It makes sense that it would be both; shiva is a prescribed time to sit and mourn with no attending to mundane business, so that one can be allowed to sit and mourn -- including staring at the wall, if that's what is needed -- instead of having to set aside that need because of other responsibilities. It is interesting that your unfamiliarity with the tradition of sitting shiva allowed you to observe more deeply this scene. My condolences to you on the loss of your father. I enjoyed reading some of your other posts. You spoke to some ideas familiar to me, such as those of schooling, reading, and electrical and analog devices and appliances. Thank you. I didn't realize that sitting shiva was literally sitting. And some silence and peace might have been good in those seven days. I've never seen the movie Yentl. I've never heard of it before. This movie will be on my movie list of movies I need to watch.